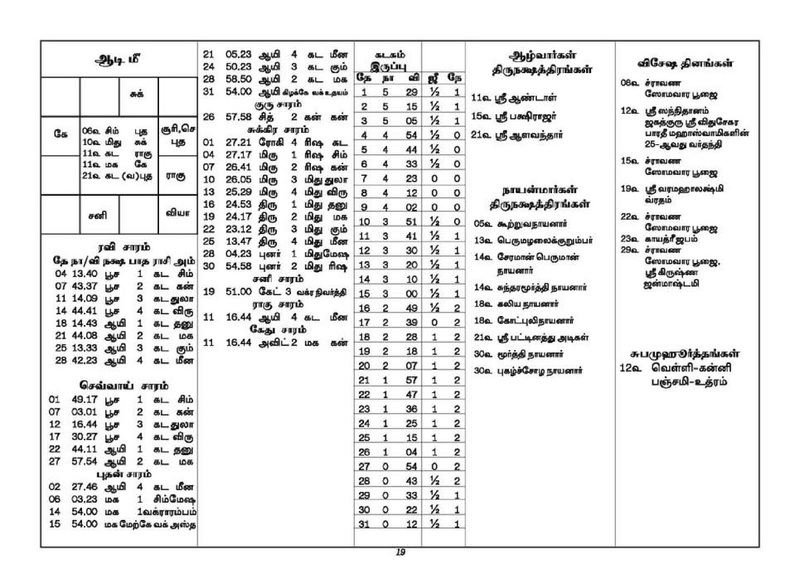 I am also attaching the pages of the Panchangam published by the Sringeri mutt . It also says the same thing. I hope this would clarify all the doubts we had about the correct Upakarma days of 2017. The sathas conducted by vaithikasree, on11th an 12th june, 2017, conlcuded that there is no grahana dosham for events that are day specific. 'மாஸ ப்ரோக்தேஷு கார்யேஷு மூடத்வம் குரு சுக்ரயோ அதிமாஸாதி தோஷாஸ் ச ந ஸ்யு: காலவிதேர் பலாத்' so the yajur ulakam should be done on 7th Aug 2017. There is also a mention that performing it on bhadrapada month under sadayam star could bring ill effects to the performer. Dont know what aGnanis like me should do? 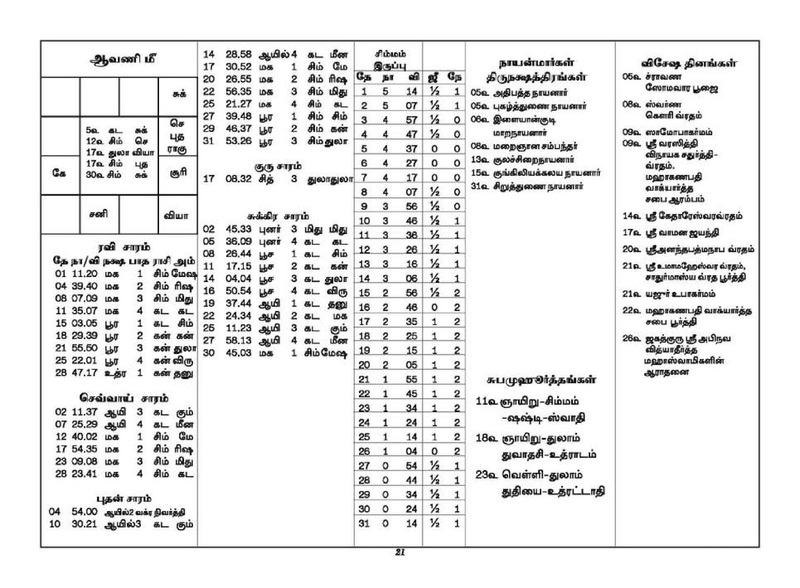 Curiously Vaithikasree did not consider (ignored?) 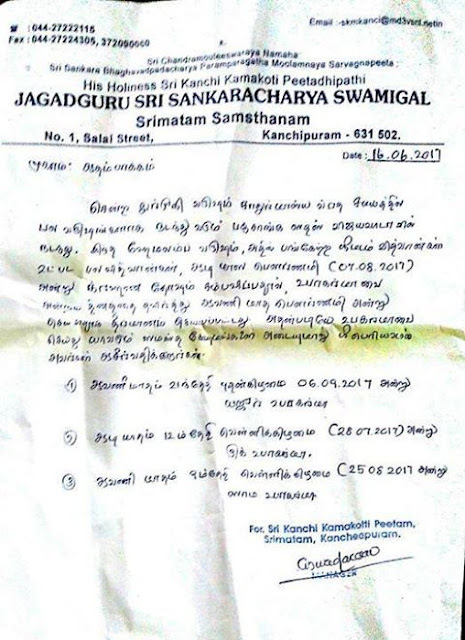 the report of Kanchi Mutt in their discussion. 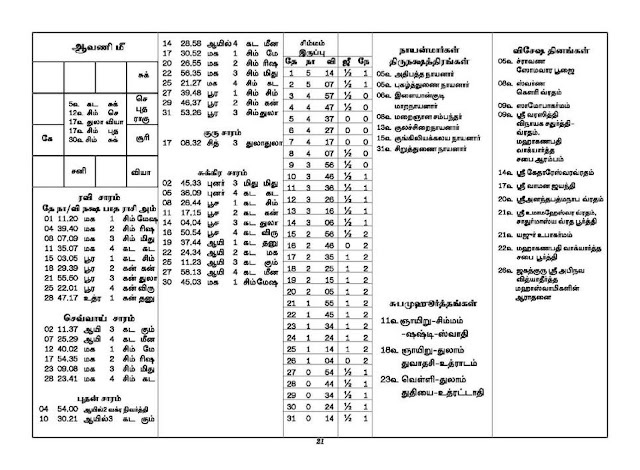 The 6 page analyses of Vaithikasree in one-sided and has not "for" arguments to conduct in "Aavani" month. It is the contradiction that stimulates deeper thinking and research. So unified thoughts are useless. There appears to be a third version.. followed by vadhyar.com which talks about 17th and 18th of august. Rightly said agyanis like us get confused. I disagree with you. Mutts are purely lokeka arrangements. They are not authorities for us. Kattradu kai mannalavu. In this world no one can claim to be a gyani. So there is no need to brand ourselves to be agyanis. Should Gayatri japam be conducted on shravana Krishna pratipat as usual or should it be on the day of upakarma. Thanks for clarification. Kanchi mutt is not the final arbiter when there is confusion. We must avoid consulting the mutt. Mutt is purely a lokeka arrangement and cannot become an authority. We must consult those experts in sharstras and teach shastras in the Sanskrit colleges. They know the correct situation. So please do not take into account any advice from the mutt without verifying that advice with the experts in sastras. Ideally, the two maths could have come to a common understanding before allowing their views to become public. This way, aasthikas could have saved themselves all this confusion. Hello Unknown, No one is demeaning the other. The Mutt is a place where the Acharyas are highly learned and respected and have the knowledge too. That does not mean that there are no other scholars. If you think you would like to go by any other person's advice, please do. BUT BOTTOM LINE IS THAT IT'S ONLY PEOPLE LIKE YOU BECAUSE OF WHOM WE HAVE INFIGHTING AND NO UNITY AMONG HINDUS. WHY THIS EGO? WHATS THAT YOU HAVE AGAINST THE MUTTS? PLEASE STOP THIS NONSENSE. VERY TRUE. BUT DON'T ABOUT THIS PERSON WHO DOESN'T EVEN DISCLOSE HIS IDENTITY.